CD-R, or Compact Disc Recordable, is a type of compact disc that can be written using disc recording hardware. This follows the format, WORM (Write once, read many) because it can only be written once but read many times. CD-R’s were engineered by the inventors of the compact disc, Phillips and Sony and was first made available in 1988. 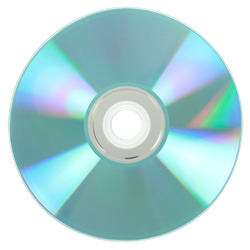 A CD-R stores digital video, images, music, documents, and data archives. In the beginning, there was a noticeable price gap between music CD-R and data CD-R due to copyright issues. The recordable disc follows Orange Book formatting standards. These standards give guidelines for CD-R specifications, pre-groove patterns, multi-session disc recordings, and measurement offerings. Cyanine is a green dye found in the earliest CD-R’s and was developed by Taiyo Yuden. The dye’s unstable chemical composition would break down within a few years, rendering it ineffective for disc archiving. Cyanine is extremely vulnerable to UV rays, so any exposure to sunlight furthered potential damage. Cyanine-hybrid dyes tend to be a bit more stable, though they are still reactive to light damage within a short timeframe. Phthalocyanine dye developed by Mitsui is more stable than its green predecessor and carries a light green hue on a metallic gold or silver surface. While phthalocyanine can withstand more ultraviolet rays and other environmental factors with a lifespan of more than 100 years, it is more susceptible than cyanine to errors from laser writing. This requires a higher laser writing speed to reduce the probability of errors. Formulated by Mitsubishi, Azo dye has a reflective dark bluish tint. Azo discs reportedly last several decades. Its chemical stability is similar to cyanine, so it must be well protected from environmental elements. Azo-dyed discs are not as widely distributed as cyanine and phthalocyanine dyed discs. Some manufacturers have allegedly added extra coloring to the dyes of their discs so it’s difficult to distinguish a particular dye, often disguising poor quality. CD-R’s are engineered with pre-grooves—writable data paths in the disc track—which guide the laser that burns recorded information. A wobble, known as an ATIP (Absolute Time in Pregroove) guarantees that the laser is guided properly and provides time code in minutes and seconds. A CD-R has no pits like a standard compact disc, rather laser pulses burn into the dyed area. The heat changes the properties of the disc to resemble pits that a disc drive can then read. A CD-R can only be written once, but this can be accomplished in a couple different ways. Disc at once (DAO) writes the entire disc in one session. Multiple tracks can be written with DAO, but there are no gaps. This burn without interruption method creates hidden unnumbered tracks b4fore your proceeding audio track begins. If you use DAO, you cannot go back and record more data on the disc at another time. A similar concept is in place for DVD-R.
Track at once (TAO) is a recording option where tracks are recorded one at a time, but it gives you the choice of writing more data later. Session at once is a recording method typically incompatible with standard CD devices but will function with computer drives. Multiple data sessions can be completed before the disc is finalized. Finalization renders the disc incapable of further recordings. CD-R’s are compatible with most standard consumer CD electronics. A CD-ROM drive should be able to read CD-R’s created in a single session.